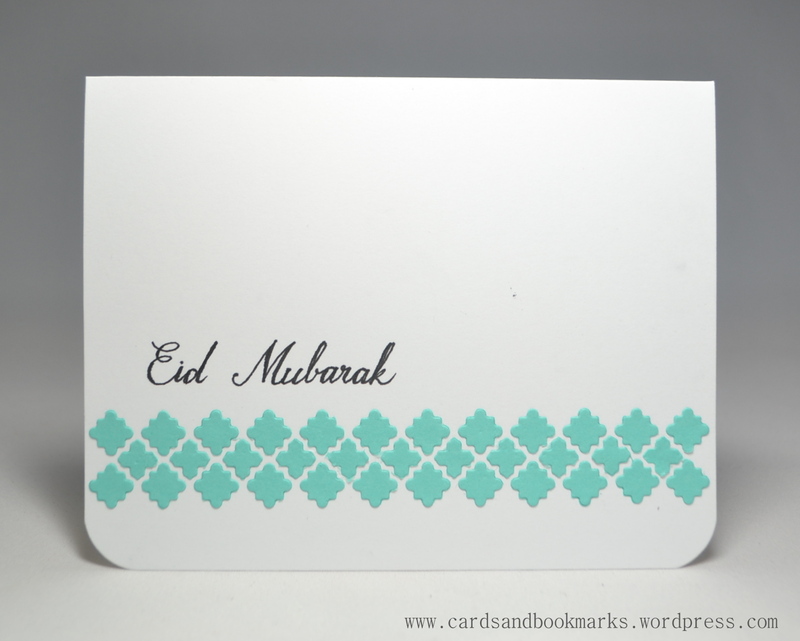 I wrote a few posts ago that I would share some Eid cards. Well, finally I am doing it today. 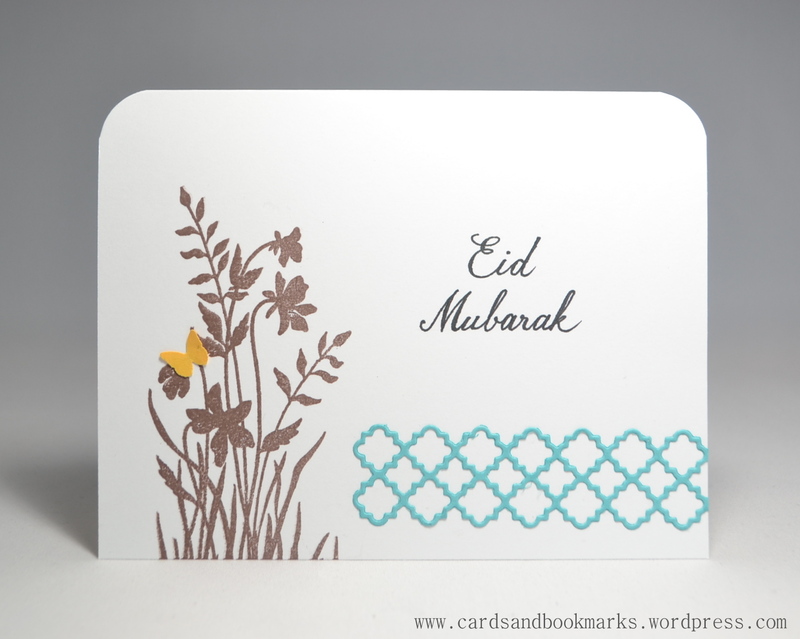 Since Eid, or any other Islamic event/ritual for that matter, does not have any symbolic association with it, the cards don’t really require a theme. I think any card would go, from pretty to cheerful to clean and simple. 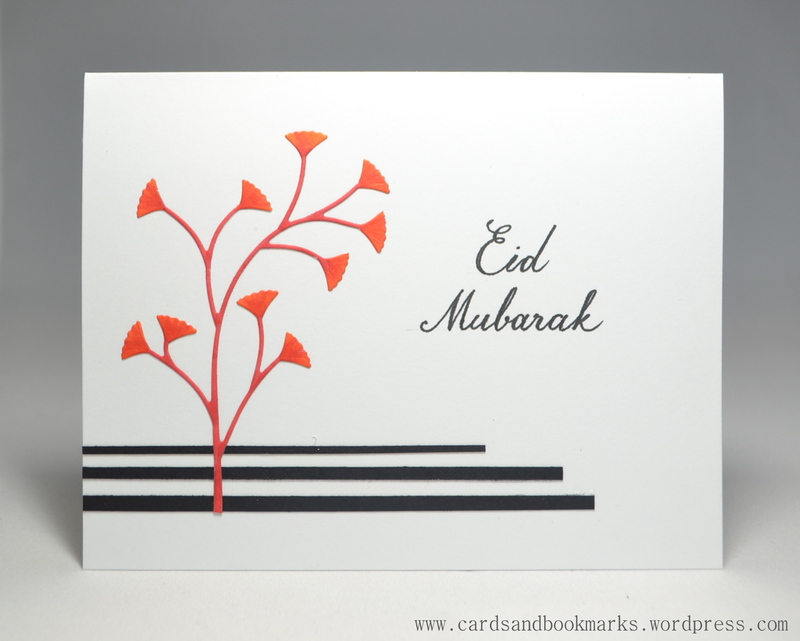 Next up is a card where I die cut the vine in white card stock and colored it with red and orange markers. I used the same vine die cut, but this time in black card stock. In the above card I die cut a label, sponged ink on it and adhered it to the card front. The flowers are stamped and cut with scissors. 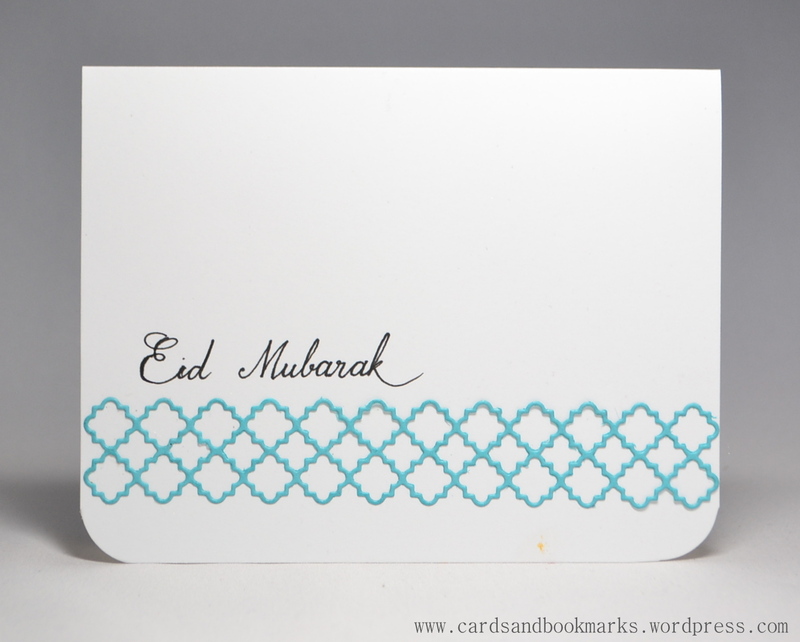 I wrote “Eid Mubarak” as in all the other cards, but here I filled in the letters with white gel pen. For the next card I used the negative of the label die cut as the card front. I stamped a chevron background stamp on it and sponged ink around the inner and outer perimeters. The flowers are stamped, cut, and colored with copic markers. 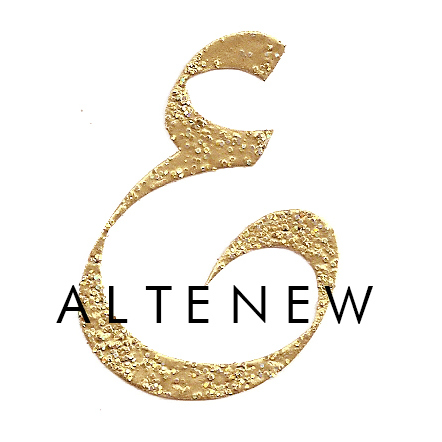 I drew two lines for the branches, and made an elaborate banner for the sentiment. I used all memory box dies, except for the label die, which was from Spellbinders. 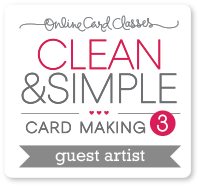 Your cards are SO clean, crisp and gorgeous! Lovely cards! 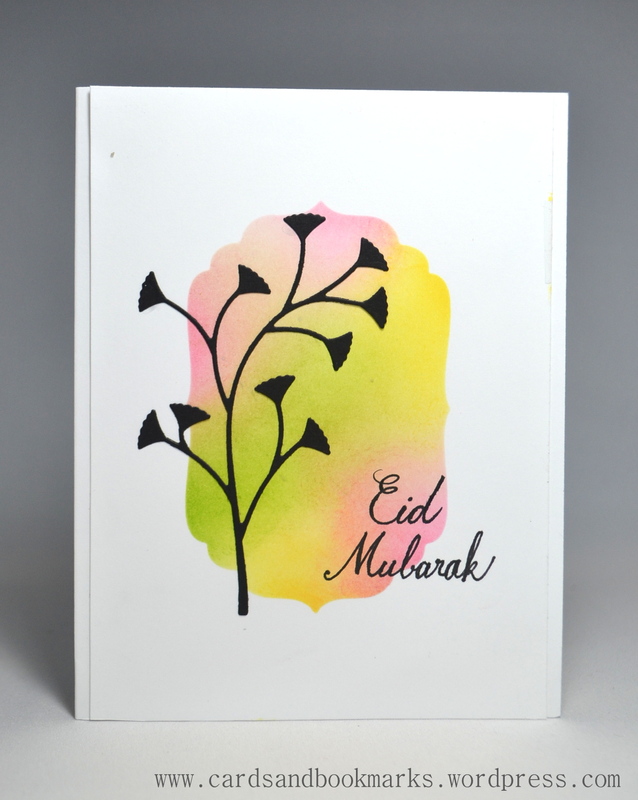 Where did you get the Eid Mubarak stamp? Oops… didn’t read your write up until after. You hve lovely printing.